Use it or lose it: fact or fiction? We’ve probably all heard the phrase: “Use it or lose it” – the belief that if we don’t keep our brains active, particularly as we grow older, our mental abilities will fade. Or that, conversely, if we stay mentally active we can hold back the inevitable decline that comes with ageing. But is that really true, and how might we differ from one another in this respect? A new study by Baowen Xue and colleagues from the RenEWL project at UCL tests the hypothesis. If, as the theory goes, a lack of mentally challenging activity can lead to a loss of ability, then retirement might increase that risk. And previous studies suggest that may be the case – we know that those who retire later have better cognitive function and a lower risk of dementia. In our study we set out to learn whether the sorts of activities we all do at work could benefit older peoples’ memories, and whether certain factors could help to preserve their abilities. There’s a theory that some of us build up ‘reserves’ which can provide us with a buffer against later decline: if we have lots of mental stimulation as children, for instance, or if we have mentally demanding jobs as adults. We wanted to test the ‘use it or lose it’ theory, and also to find out whether those who work in high-grade jobs might be at lower risk of cognitive decline after retirement. The subjects for our research were 3433 people who participated in the Whitehall II Study, which followed a cohort of civil servants for more than 30 years, beginning when they were aged between 35 and 55. We were able to look at measurements of the participants’ cognitive abilities from up to 14 years before they retired and for up to 14 years afterwards. The participants were tested on four different measures. Their verbal memory was assessed through a test in which they listened to a list of words and were then given two minutes to write down as many as possible. Verbal fluency was judged in two ways – participants were asked to write as many words beginning with ‘S’ as they could within one minute – ‘phonemic’ fluency – and also to recall as many animal names as possible within the same time – ‘semantic’ fluency. Finally, abstract reasoning – the ability to identify patterns and rules in data and to use them to solve problems – was measured through a four-part test known as AH4. We found that participants’ abilities decreased over time on all four measures. But the decline in verbal memory scores was 38 per cent faster after retirement than it was before, even after taking account of that age-related deterioration. Those who worked in higher-grade jobs also had some protection while they were still working, but this effect was lost when they retired. However, while retirement had a significant impact on verbal memory, particularly for those in more senior jobs, it did not make a difference when it came to the other tests we looked at – verbal fluency and abstract reasoning. Nor were there any significant differences in verbal memory decline between men and women in our sample. Our findings are consistent with the theory of ‘mental retirement’ – suggesting that the work environment can be more mentally stimulating than the leisure environment as a retiree. As well as losing the direct stimulation they get from work, retirees may also suffer from indirect effects – from losing the need for self-discipline and organisation, for example, as well as from having fewer opportunities to communicate and collaborate with others. For instance, social networks could be more extensive during employment than they are later in life. The finding that employees in high grade jobs suffer smaller declines before retirement also points to a wider significance – all of us can benefit, in terms of memory, from mentally stimulating activities. So, do our findings support the ‘use it or lose it’ theory? Yes, they do. They suggest that failing to keep mentally active may lead to faster cognitive decline after retirement. 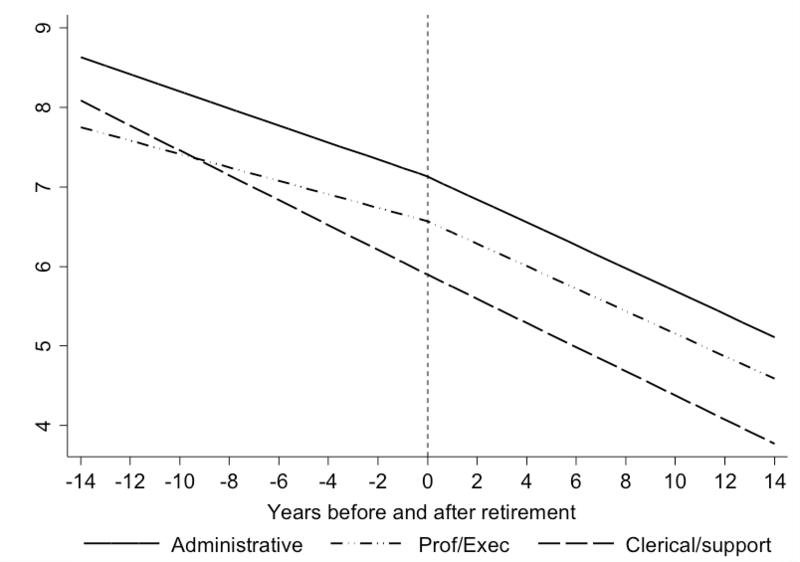 Effect of retirement on cognitive function: the Whitehall II cohort study, by Baowen Xue, Dorina Cadar, Maria Fleischmann, Stephen Stansfeld, Ewan Carr,Mika Kivimäki, Anne McMunn and Jenny Head, is published in the European Journal of Epidemiology. This entry was posted in Journal article and tagged Ageing, Cognitive function, Well-being, Whitehall Study, Work on June 11, 2018 by Chris Garrington. Work and family conflict: who is at risk? Juggling the demands of work and family can create conflict and this can play out differently for men and women. But what other factors are at play? Do things like the sort of job we do and the levels of control we feel we have at work and at home matter too? It’s a subject of keen interest not just to individuals, but also employers and Government, who are being urged to provide more and better support for working parents. Dr Helena Falkenberg from Stockholm University and a team of colleagues have been investigating and find that these other factors do indeed matter, especially for women in senior level jobs. Being in a job we enjoy and having a family are sources of great satisfaction, but also of conflicting demands. From organising childcare and sharing the housework to getting that all important report done on time and preparing for a big presentation, being a working parent can be tough at times. Maybe there’s a special breakfast meeting that means mum or dad can’t take the kids to school or perhaps one of the children is suddenly unwell and decisions need to be taken around which parent will take time off. Work gets in the way of family life and family matters can prevent us getting on with our work. A recent report from the Chartered Institute of Professional Development (CIPD) called for a step change in support for working parents from UK Government and employers, claiming initiatives such as Shared Parental Leave and free childcare policies are not hitting the mark, despite being well intentioned. In this research, rather than looking simply at how and to what extent men and women are conflicted over work and family, we try to pinpoint more clearly other aspects of our lives that might be linked with conflict. In that we way, we can identify more clearly the sorts of individuals at greatest risk which in turn might help employers and policymakers identify and target support at specific groups. This study investigated the links between gender and socioeconomic status (specifically in this case the type of job people did) and levels of conflict. It also examined how levels of control at home and work increased or reduced conflict. The findings suggest that if you are a woman or have a higher level job, you are most likely to experience conflict between work and family life. In addition, the less in control you feel at work and at home, the greater that conflict is for both men and women. Our study highlights the need to make it easier for higher status employees to combine work and family, especially women, and to increase the levels of control at work and at home to help individuals manage work and family successfully. Participants in the study were asked whether and to what extent their work interfered with family life. For example did work commitments reduce the amount of time they could spend with the family. Did their job involve a lot of travel away from home and did it make them irritable at home or leave them lacking the energy needed to do home and family related things. When it came to how family got in the way of work, they were asked if family matters distracted them from getting on with work, prevent them from getting enough sleep to be do their job well and having enough time to themselves. When we took into account factors such as part-time work, whether the individuals were married, had children or other caring responsibilities, women reported more conflict between work and family than men. When we added in to the analysis how much control over work and home life participants felt they had, the difference between men and women was even more pronounced. Having a more senior position was also a key factor for both sexes, but especially for women. The small number of women at high grades in the civil service and other areas of the labour market appears, to some extent, to reflect the difficulties for women in high positions to combine work and family. Notably in our study sample, more than half of the women with senior level jobs did not have children. When it came to how family interfered with work, once again women fared worse than men, with women having more than twice the risk of their family life interfering with their work life. Of the women, those in higher positions fared worst of all. The type of job the men did in the study did not make a difference to the levels of interference. Participants who reported low levels of control at work were most likely to say that work interfered with family life, indicating that more control and flexibility at work eases the transition between work and family. There was less of a link between low levels of control at work and those reporting family interference with work. However the interaction between control at work and the influences of socioeconomic status and gender needs further research to draw significant conclusions. Low levels of control at home also contributed to a markedly higher risk of work-family and family-work conflict. This seemed to be equally important for women and men no matter what their position at work. To develop effective policies on work-family balance, the home sphere will need further research. One limitation of our study is that it was conducted among white-collar British civil servants, and the findings may differ among other working populations and, particularly, in different countries with different social security systems. Information was also collected some years ago. However, we found clear evidence that women experienced more interference between work and family and vice versa than men, especially women in senior positions. This is important as it might influence their career choices and their health over time. We hope this research and further work in this area will help employers and Government to get a more nuanced picture of what factors are at play when it comes to the issues facing working parents, and ultimately develop initiatives and approaches that can reduce the conflict in a way that helps them to thrive at work and at home. Do gender and socioeconomic status matter when combining work and family: Could control at work and at home help? Results from the Whitehall II study is research by Helena Falkenberg and Petra Lindfors of Stockholm University, Tarani Chandola of the University of Manchester and the ESRC International Centre for Lifecourse Studies, and Jenny Head of University College London. It is published in the journal Economic and Industrial Democracy. This entry was posted in Journal article and tagged Career, Childcare, Conflict, Employment, Family, Fathers, Flexible working, Gender, Health, Mothers, SES, Well-being, Whitehall Study, Work on January 11, 2017 by Chris Garrington.